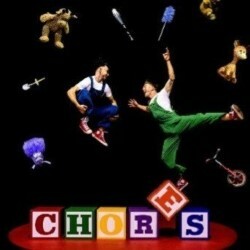 Chores is the story of two typical young rascal boys playing in their messy bedroom. Suddenly, Mother's alarming screams rattle the boys into acrobatic action. A generous serve of comedy and chaotic acrobatics accompanies every attempt at cleaning their room. A comedy circus show from Australia the whole family will love. 'Hilarity ensues with this laugh-out-loud slapstick comedy' ***** (Advertiser, Adelaide). 'After watching Chores I really want a toilet paper gun now' ***** (WeekendNotes.co.uk). Winner – Audience Choice Award, Prague Fringe 2018. Winner – Best Children's Show 2018, Adelaide Fringe Weekly.